The Tidyverse is a set of packages that work together within a common tidy-data framework.1 These packages modernize R and enable an efficient workflow. This tidy framework is great for learning while being productive. As you see from the image above, the tidyverse package is a super-package consisting of several more precise and focused packages. You can install packages from the Tools menu-bar in the RStudio IDE. Outside of this workshop, you’ll likely want to load your own data. R and RStudio support many methods of gathering and importing data. Two common data import methods include importing data from the local file system or via a URL. Or, via the Import Dataset “button” found in the Environment Pane. Using the Import wizard, you can generate (and execute) the code necessary to read in the cars.csv file. # 'read_csv()' is part of the tidyverse 'readr' package. During this workshop demonstration, We’ll use the Starwars characters dataset, starwars. The data, part of the dplyr package, come from SWAPI, the Star Wars API, http://swapi.co/. Since the data are integrated into dplyr, we don’t need to load the data, but you may still want to find information about the dataset. The codebood for the Starwars dataset is integrated into the dplyr documentation. To view the Starwars codebook, first load the library(dplyr) package. Then, via the Help pane, search starwars. Alternatively, in the Console pane, type ?starwars. In the next module, Data Wrangling, we’ll discus the dplyr package in greater detail. View your data in a grid. View() is an exploratory convenience while using RStudio. View() will not generate output in your RMarkdown reports, but one advantage to View() is an on-board, clickable, sortable data-viewer used while computing within RStudio. 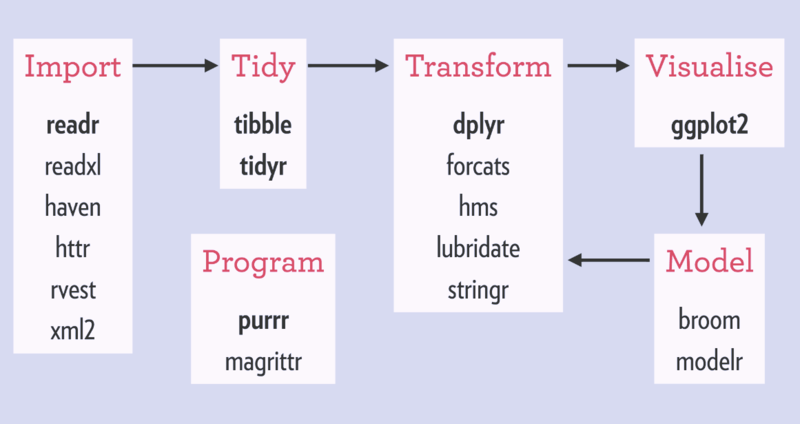 A tibble (tbl) is a “Table as data frame”, a modern tidyverse table. The old-school way to glimpse into the structure is via the str() function. It’s fine but not as pretty as glimpse(). Sometimes it’s necessary to str(), particularly when investigating the structure of lists – but that’s way beyond what we’re talking about here. str(starwars)  #example, not executed. Practice this in your RStudio console or R Notebook. class() identifies the class of an object revealing the data structure or the data type. You can reference a vector within a dataframe via the $<<column_name>> syntax. ##   "name"       "height"     "mass"       "hair_color" "skin_color"
##   "eye_color"  "birth_year" "gender"     "homeworld"  "species"